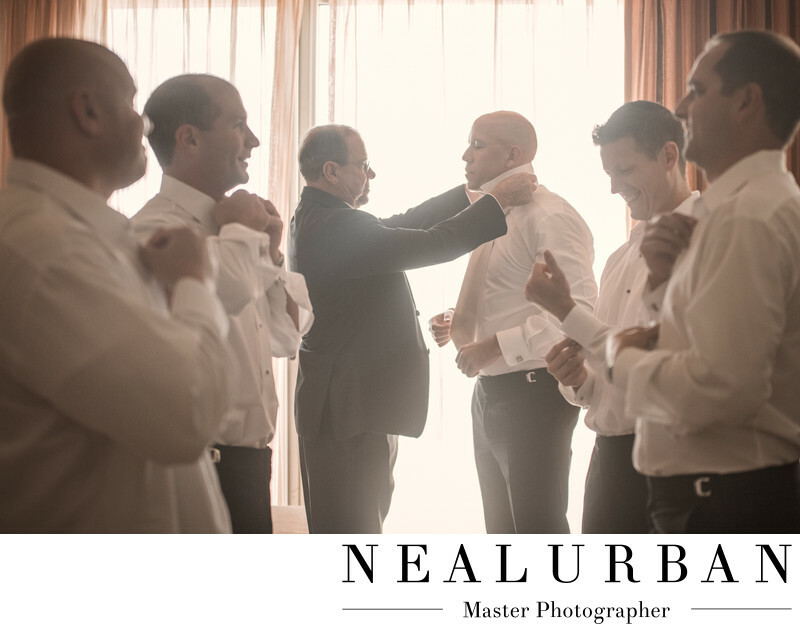 This is a great moment between Joe, his father surrounded by his groomsmen who all travelled to Puerto Vallarta, Mexico for Sylvia and Joe's destination wedding. Sylvia grew up there and wanted her wedding at home! They had their ceremony at Our Lady of Guadalupe Church. The reception was at the NOW Amber Resort. We all stayed there. This is where the bride and groom got ready as well! This made it easy for us to hop back and forth between the hotel suites. Not a moment was missed between both parties getting ready. Danielle stayed with the girls while Neal captured the guys getting ready. Sometimes guys need direction of where to stand. We often place people in the best light and then we let the moment happen. Joe and Sylvia had a first moment shortly after this. They didn't see each other like a first look. They stood near each other where a room divider separated them. They read personal letters to each other so all they could do was hear their voices. It was a beautiful and emotional moment hence "the first moment". After this we left for the ceremony and then photos on Main street and on the boardwalk by the beach. It was a beautiful wedding! Location: NOW Amber Puerta Vallarta Mexico.